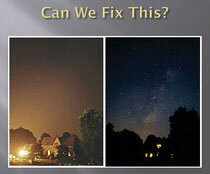 A bill that would direct the Washington State Department of Ecology to recommend ways to reduce light pollution in the state is scheduled to receive a hearing tomorrow before the House Environment Committee. The measure, HB 2057, directs the department to complete a study of the environmental, economic, and public health effects of light pollution, and to submit the study and policy recommendations for reducing light pollution to the Legislature by next January. The hearing is scheduled to begin at 1:30 p.m. Jan. 12 in House Hearing Room B in the John L. O’Brien building on the state capitol campus in Olympia. SHINING A LIGHT ON DARKNESS: Representatives from and supporters of the Goldendale Observatory showed up last Tuesday at the Klickitat County Commissioners meeting to press for compliance with dark sky policies. A slide from a presentation by Bob Yoesle shows the dramatic difference in night visibility between light spillage on the left and safe, dark-sky friendly lighting on the right. Concerns about safety and costs of dark-sky lighting were raised and addressed, with the group asserting safety could actually be enhanced and costs could be lessened with environmentally sound lighting. Okanogan County Electric Cooperative (OCEC) has completed the conversion of its street lighting system to a new system using LED, Dark Sky compliant lighting fixtures. The project involved changing out the 86 OCEC owned fixtures on power poles throughout the upper valley. Lighting owned by the town or other electric utilities is not part of this program. Chances are you can't see the Milky Way at night. That's because the glare from city lights washes out all but the brightest stars where most people live. A smattering of Northwest cities and counties are taking action by passing new rules for outdoor lighting. It's not all about the stars. And some people take a dim view of light regulation.